The Temple. Photo by Ellis Vener/Courtesy of The Temple. Atlanta, y’all, is a story of struggle and success. Rich in history and dripping in Southern charm, the belle of the South is progressive and multiethnic. Home to the busiest airport in the world, Hartsfield-Jackson Atlanta International Airport, the city draws conventions, tourists and transplants from across the globe. More than 1,000 multinational businesses dot the region. Atlanta also boasts world headquarters for Fortune 500companies, including The Home Depot—the brainchild of two Jewish entrepreneurs—and Coca-Cola, with a Jewish origin story. Atlanta Jews often bring accents from elsewhere, from New York to Miami. Greater Atlanta serves a diverse population of 5.7 million residents. More than 120,000 of them are Jewish—making up the ninth-largest Jewish-populated metropolitan area. Once a sleepy railroad terminus, Atlanta predates the Civil War and its Gone with the Wind imagery. Founded in 1837 at the end of Georgia’s Western & Atlantic Railroad line, the town was called Marthasville in honor of the then-governor’s daughter. It was incorporated as Atlanta in 1847 and comprised about 30 stores, a handful of hotels and schools, one church and approximately 2,500 residents. Perhaps 25 were Jewish. Most Jews who migrated to Atlanta in the mid-19th century were German-speaking and had lived in the United States for a decade or more. Their business savvy and connections to Northern wholesale markets and available credit gave them an edge in a city rebuilding its commercial and civic institutions after the Civil War. Among the early names were Morris Rich, a peddler who opened a dry goods concern that turned into the largest department store in the Southeast, and Jacob Elsas, who created Fulton Cotton Spinning Company, later known as Fulton Bag & Cotton Mill. Elsas played a key role in the founding of the Georgia Institute of Technology. German Jews established the Hebrew Benevolent Congregation (now known as The Temple) in 1867. Atlanta’s oldest Jewish institution, it grew out of the Hebrew Benevolent Society, founded in 1860 to obtain a burial ground and provide relief for the Jewish poor. In 1887, a handful of East European immigrants formed Congregation Ahawas Achim, later Ahavath Achim Synagogue—the city’s second synagogue—as an Orthodox breakaway from the more Reform-minded Hebrew Benevolent Congregation. Elsewhere in town, Ebenezer Baptist Church—where the Rev. Martin Luther King Jr. would serve as pastor—was founded one year earlier. Jews and African-Americans would cross paths in the next century in their stand for civil rights. Ahavath Achim joined the Conservative Movement in 1952. Unhappy that the synagogue was heading away from Orthodoxy, some members had already left in 1943, forming Congregation Beth Jacob. 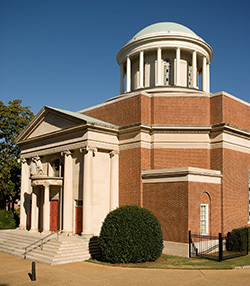 Today, Beth Jacob is Atlanta’s largest Orthodox synagogue, with more than 500 members. The modern community has survived its share of internal and external struggles. The only lynching of a Jew in the history of America occurred here in 1915. A mob lynched Leo Frank after his death sentence for allegedly murdering Mary Phagan had been commuted to a life sentence by the governor. In 1982, it came to light that Phagan’s real murderer was a janitor working at the National Pencil Factory, where both Frank and she were employed. The Jewish community petitioned for a posthumous pardon for Frank, and Georgia issued a pardon of sorts on the grounds that Frank’s civil rights were violated when the state failed to protect him from the vigilante lynch mob. Civil rights themes echoed throughout the Jewish community and the city’s history. The two often intersected, such as in 1958, when a wide swath of citizens came together in the face of hatred after a bundle of dynamite blew out the side wall of The Temple. The perpetrators, a group of white supremacists, were angered by The Temple’s ongoing and vocal support of civil rights. Driving Miss Daisy by Atlanta native Alfred Uhry is a 1987 play that became a movie about the relationship between an elderly Atlanta Jewish widow, Daisy Werthan, and her African-American chauffeur, Hoke Colburn. Uhry set two other plays in Atlanta as well, The Last Night of Ballyhoo and Parade; all three were inspired by his experience growing up Jewish in Georgia’s capital in the 1940s and 1950s. The plays are said to parallel historic moments in the city’s 20th- century history: the 1915 lynching of Frank; the 1939 Gone with the Wind premiere; the 1958 Temple bombing; and the 1964 dinner honoring King’s Nobel Peace Prize. The permanent collection of the William Breman Jewish Heritage Museum. The Temple, Ahavath Achim and Beth Jacob are among some 40 Ashkenazic and Sephardic congregations spread out across Greater Atlanta’s more than 8,000 square miles. Several Chabad groups grace different types of communities, from the universities to urban and suburban neighborhoods. The Jewish infrastructure, good business climate, natural beauty and warm culture have brought Jews from across North America as well as Argentina, England, Germany, Iran, Israel, Russia, South Africa, Turkey and the Greek island of Rhodes to settle in Atlanta. Founded on November 2, 1916, with 18 charter members, what is today Greater Atlanta Hadassah comprises six groups with more than 3,000 members. Atlanta Hadassah is celebrating its 100 years of leadership, fundraising, sewing circles, luncheons, letter-writing campaigns and advocacy by hosting Hadassah’s National Convention at the Marriott Atlanta Grand Marquis from July 25 to 28. “Many of our current leaders can trace their leadership skills to their mothers and grandmothers and are active in many aspects of Atlanta’s Jewish community,” says Greater Atlanta Hadassah President Paula Zucker. “Atlanta’s diverse Jewish community is reflected in our membership, with leaders of all ages and backgrounds.” One such leader, Dr. Rachel Schonberger, is a retired internist in the Atlanta area as well as chair of the Hadassah Medical Organization. The Atlanta Jewish Film Festival infuses the community with light and energy in the dead of winter. The world’s largest Jewish film festival is a cinematic smorgasbord. This year it brought 77 films to town in 23 days, along with writers and directors. The Book Festival of the Marcus Jewish Community Center of Atlanta will observe its 25th anniversary in November. In 2015, it drew locals and out-of-towners for inspiring, funny, educational talks and readings by the likes of Mitch Albom, Naomi Ragen, Judy Blume, Ted Koppel and Arlene and Alan Alda. Bronze sculptures outside the Marcus JCC. Photo by Ronda Robinson. Currently on display, the exhibit “Eighteen Artifacts: A Story of Jewish Atlanta” includes a dress from a production of Driving Miss Daisy at the city’s Alliance Theater; one of the first Home Depot aprons from the flagship store; a Lenox ceramic bowl commemorating the 100th anniversary of Rich’s Department Store; and a letter from King thanking Jewish philanthropist William Breman for putting together an integrated dinner in his honor after he won the Nobel Peace Prize. The Breman also offers a concert series, talks by local Holocaust survivors and Historic Jewish Atlanta Tours as well as a Historic Jewish Atlanta app. In the northern, leafy suburb of Dunwoody, the Marcus Jewish Community Center of Atlanta offers cultural and sports programs for all ages. Visitors enjoy a theater, art gallery and glatt kosher restaurant serving meat and dairy as well as the Besser Holocaust Memorial Garden, located in adjacent Zaban Park. Enter the memorial garden beneath an archway bearing the word zachor (remember) etched in stone. Follow the winding path past nine bronze sculptures by artist Dee Clements as well as a ner tamid. 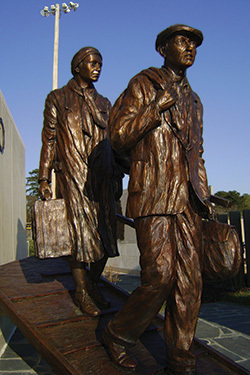 Clements’s statues re-create aspects of Jewish life before, during and after World War II. Another notable monument is the Memorial to the Six Million at Greenwood Cemetery, southeast of downtown, designed by local architect and Holocaust survivor Benjamin Hirsch. The stone memorial is topped by six candle-like pillars that are lit during special ceremonies. The structure’s high walls are flanked by three small cut-out entrances that lend an air of privacy and protection. Inside the open-air memorial are plaques bearing the names of hundreds of victims whose descendants reside in Atlanta. Hirsch’s creation won a national design award in 1968 and earned National Register of Historic Place status in 2008. The Holocaust theme continues at “Anne Frank in the World: 1925-1945,” an exhibit located in a strip mall in Sandy Springs, a 20-minute drive north of the city. Cleverly hidden behind a bookcase, the 600-photograph exhibit was developed by the Anne Frank House in Amsterdam and is presented by the Georgia Commission on the Holocaust. Philip Trammell Shutze, an important Atlanta architect of the early 20th century, designed The Temple’s current building in midtown in 1931. The floor plan of the sanctuary is modeled on King Solomon’s Temple in Jerusalem, with the foyer representing the outer courts of Solomon’s Temple, and the worship hall, the inner courts. The raised bima and golden Ark containing Torah scrolls parallel the Holy of Holies. Jewish symbols adorn the ceilings, walls and terrazzo floor in the foyer. The High Museum of Art. Courtesy of Atlanta Convention & Visitors Bureau. 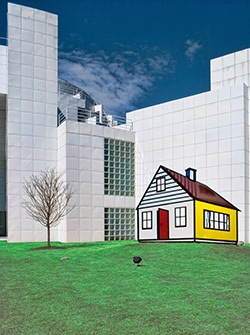 After touring the Jewish sights, head to the High Museum of Art in midtown and enjoy its classical and contemporary art and award-winning architecture. Famous Jewish artists in the museum’s collections include French painter Camille Pissarro and Russian-French painter Chaim Soutine as well as modern artists Alex Katz and Roy Lichtenstein. 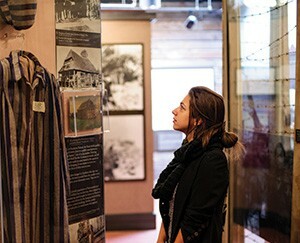 Attractions across Atlanta are devoted to human and civil rights. Downtown, the Martin Luther King Jr. National Historic Site contains the Baptist minister and civil rights leader’s boyhood home as well as his final resting place. 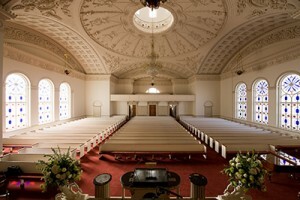 Also at the site, you can visit the restored Ebenezer Baptist Church. There you can sit in a pew and hear King’s stirring voice overhead in a taped recording of “I’ve Been to the Mountaintop”—his last speech before he was assassinated in Memphis in 1968. Hop aboard the nearby Atlanta Streetcar for a fun, convenient way to travel a few miles to the National Center for Civil and Human Rights. Several exhibits are interactive, including a re-creation of a lunch counter sit-in that gives a taste of a protester’s experience, complete with vicious taunts and shaking seats. To lighten your mood, step outside, breathe some fresh air and stroll around Centennial Olympic Park. Other sights in the park area include the Georgia Aquarium, a gift to the city by The Home Depot cofounder Bernie Marcus and his wife, Billi; CNN Center, which offers tours; and the World of Coca-Cola. Coca-Cola was first served as a fountain drink at Jewish pharmacist Joseph Jacobs’s drugstore in downtown Atlanta in the late 1800’s. Warm Springs, 80 miles southwest of Atlanta, is home to President Franklin D. Roosevelt’s beloved Little White House, which is open to tourists. He visited the town’s naturally heated mineral springs for treatment for his polio-related paralysis. The springs are not available for public use. 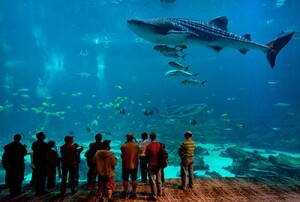 The Georgia Aquarium. Courtesy of Atlanta Convention & Visitors Bureau. Callaway Gardens, about 70 miles southwest of Atlanta, features gardens, golf, shopping, dining, geocaching, balloon festivals, fitness events, trail walks, water sports and more. Don’t miss the magical butterfly gardens. Bernie Marcus and Arthur Blank cofounded The Home Depot in 1979 and became billionaires. Blank owns the Atlanta Falcons of the National Football League. As philanthropists, Marcus and Blank support Jewish, medical and educational institutions, among others. Businessman Sam Massell was Atlanta’s first Jewish mayor, serving from 1970 to 1974. Other Jewish politicians have left their imprint, including city council member Barbara Asher, who was instrumental in bringing the 1996 Olympics to Atlanta. Georgia Attorney General Sam Olens is the state’s highest-ranking elected Jewish official. Emory University Professor Kenneth Stein, the first executive director at the Carter Center, and Stephen Selig III, national finance chairman for the Carter-Mondale Presidential Committee, were among 14 Atlanta leaders who resigned from the center’s advisory board in 2007 to protest President Jimmy Carter’s criticisms of Israel and American Jewish political power. The Jewish Federation of Greater Atlanta publishes Shalom Atlanta, featuring an extensive listing of community resources from mikves, mohels and day schools to Judaica shops and kosher restaurants. 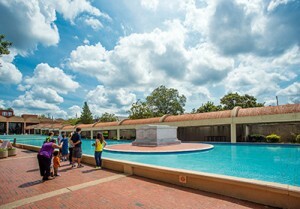 The MLK burial site. Courtesy of Atlanta Convention & Visitors Bureau. What do Fried Green Tomatoes and The Hunger Games have in common with Driving Miss Daisy? All were filmed in the Atlanta area. The Peach State has succeeded in marketing itself as a location for film productions. For example, the Marriott Atlanta Grand Marquis—where Hadassah is holding its convention in July—was used as the Tribute Quarters in Catching Fire and Mockingjay–Part 1. The films feature dramatic vistas of and from the atrium’s 52-story glass elevators. For details on visiting Georgia’s filming locations, go online. Tomorrow is another day, Scarlett, and a perfect time to discover the history of that beloved novel and movie on Georgia’s Gone with the Wind Trail. Visit The Atlanta BeltLine for a walk, run or bike ride. The BeltLine combines rail, trail, green space, housing and art, and ultimately will connect 45 neighborhoods. Linked directly to the BeltLine, the culinary gathering place Ponce City Market offers everything from Georgia- and Carolinas-caught fish to cold-pressed juice and locally made Korean kimchi and steamed buns. Whichever way you turn, Atlanta is a peach of a town that continues to grow and spread its welcoming branches to residents and visitors alike. A native Southerner, Ronda Robinson has called Atlanta home for several years. She is the author of Beyond Politics: Inspirational People of Israel (Mazo Publishers).